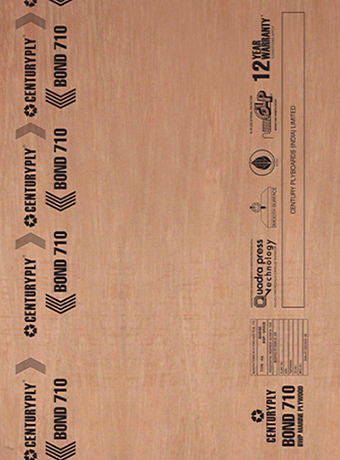 Centuryply Bond 710 is manufactured using Quadra Press technology that involves pressing the plywood 4 times in controlled temperature. It distributes the glue evenly between the layers and ensures better bonding. Synchronised glue and heat application, and stage-wise compression between alternate cold and hot press cycles, provides superior moisture control and makes the plywood bend and warp resistant. It also increases the strength, stability and durability. During Quadra Press, surface preparation and sanding of the panel is done to get smooth surface and reduce thickness variation. Additionally, Glue Line Protection and ACC treatment make BOND 710 borer termite proof with 7 year warranty.